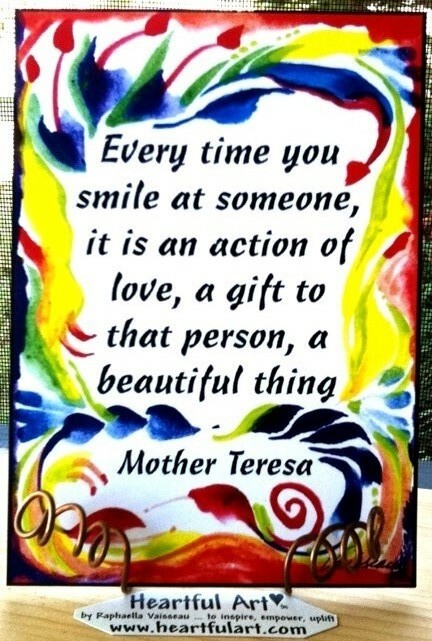 Poster or print of famous Mother Teresa quote with art by Raphaella Vaisseau: "Every time you smile at someone it is an action of love, a gift to that person, a beautiful thing"
What an inspiration, a beautiful servant for good Mother Teresa was, with wise words, kind deeds, and a gentle spirit. Smile. Share your Light. Give of yourself. Spread joy. Enjoy life. Be happy.